Most Caribbean coral reefs will disappear in 20 years if we don't restore the grazers that defend the corals from seaweed. 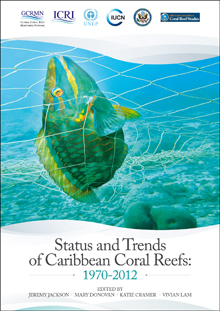 This is a major message of the new report, "Status and Trends of Caribbean Coral Reefs: 1970-2012," released on 2 July 2014. The report is the result of a three-year joint effort of the Global Coral Reef Monitoring Network (GCRMN), the International Union for the Conservation of Nature (IUCN), and the United Nations Environmental Programme (UNEP). 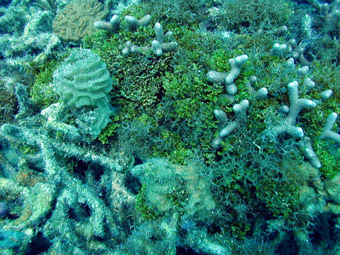 Reef degradation - Corals overgrown by algae, Dry Tortugas, Florida Keys, 2000: Photograph courtesy of and (c) Mark ChiapponeIn 1972, famed marine biologist Sylvia Earle said Caribbean coral reefs are, "almost devoid of conspicuous plants." Today the opposite is true -- reefs are dominated by conspicuous seaweeds overgrowing, smothering, and poisoning Caribbean corals. The new report shows a more than fifty percent decline in living corals throughout the Caribbean over the past half century. "The decline in corals began long before climate change began to affect reefs," says Terry Hughes, author of a 1994 study that predicted the current problems due to parrotfish removal. Discoveries in Coral Reefs," a production by Horizon International, was filmed entirely in the waters off Bonaire by Oscar-winning underwater videographer Nick Caloyianis who captured moray eels with cleaner fish swimming in and out of their mouths, camouflaged poisonous rock fish emerging from their perches, sea horses gracefully slithering from coral branch to coral branch, and barracudas lurking about. These "Resilient Reefs" have strong local protections that are strictly enforced and live coral cover is more than double or triple the average coral cover of 14% seen throughout the Caribbean. 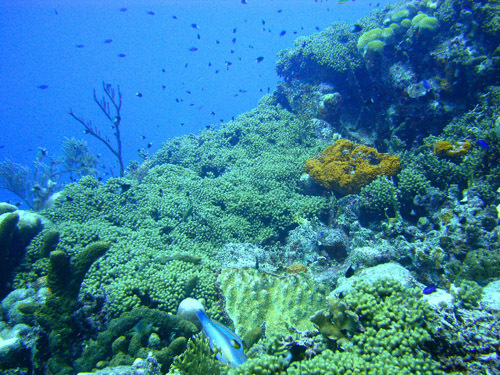 Most notable of these are the Flower Garden Banks (55% live coral cover), Bermuda (35%) and Bonaire (35%). All of these places prevent the fishing of parrotfish. The Flower Gardens in the northern Gulf of Mexico are protected by their United States National Marine Sanctuary status, which prohibits the use of fish traps and parrot fishing. Bermuda has an even longer history of banning fish traps and spearfishing. And Bonaire, with an entirely tourist-based economy that is reliant on the health of their reefs, has long restricted fishing. A brief breakdown in these protections resulted in an immediate decline in the health of Bonaire’s reefs, which triggered a quick restitution of protections. 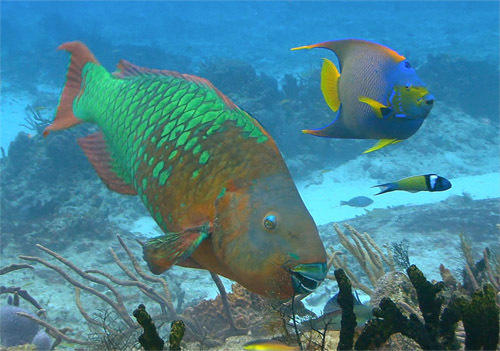 But reefs where parrotfish are unprotected have suffered tragic declines. These “Failure Reefs” are places where a variety of local human impacts have been allowed to run unchecked: not just by overfishing but also by overuse for recreation, excessive and destructive coastal development, and pollution. The worst of these include Jamaica, the entire Florida Reef Tract from Miami to Key West, and the US Virgin Islands. We can fix this problem of conserving Caribbean coral reefs. Fish are being destroyed despite their enormous economic and ecological value to the very survival of coral reefs and the goods and services provided by healthy reefs. 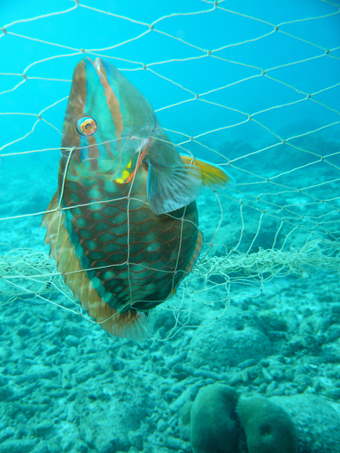 The report strongly advocates banning all fish traps throughout the Caribbean, banning spearfishing (a practice that cannot be regulated at the level of fish species), and banning all other fisheries practices that harm parrotfish. To achieve this goal, “we support the formation of a network of Caribbean nations working together for a unified response to the Caribbean coral reef crisis” says Jerker Tamelander, head of the UNEP coral reef unit. Some countries are already taking new positive action. Barbuda is moving to ban all catches of parrotfish and grazing sea urchins while also planning to set aside one third of their coastal waters as marine reserves. “This is the kind of aggressive management that needs to be replicated regionally if we are going to increase the resilience of Caribbean reefs,” says Ayana Johnson of the Waitt Institute’s Blue Halo Initiative that is collaborating with Barbuda in the development of their new management plan. Another problem discussed in the report is the “massive outbreak of coral diseases and mass die-off of sea urchin close to the Panama Canal…” The order-of-magnitude increase in bulk shipping in the 1960s and 1970s has introduced pathogens and invasive species that have since spread in the Caribbean. Carl Lundin writes that, “Saving Caribbean coral reefs is a major challenge, but to quote the legendary Jamaican reggae star Jimmy Cliff, ‘You can get it if you really want, but you must try, try and try. You'll succeed at last.’ "
ReportThe new report confirms that a unifying attribute of the healthiest Caribbean coral reefs is vigorous populations of grazing parrotfish. 4. Engage with indigenous and local communities and other stakeholders to communicate the benefits of such strategies for coral reef ecosystems, the replenishment of fisheries stocks and communities’ economy. The Report was published with the support from The International Coral Reef Initiative (ICRI), the ARC Centre of Excellence for Coral Reef Studies, United States State Department, United Nations Environment Programme (UNEP), Ministry of Economic Affairs of the Netherlands, Summit Foundation, McQuown Foundation and the Smithsonian Tropical Research Institute. It is most detailed and comprehensive study of its kind published to date, according to IUCN: The result of the work of 90 experts over the course of three years. It contains the analysis of more than 35,000 surveys conducted at 90 Caribbean locations since 1970, including studies of corals, seaweeds, grazing sea urchins and fish. This news is from IUCN with special thanks to contributions from Carl Gustaf Lundin, Director of IUCN’s Global Marine and Polar Programme. · Read more about the Flower Garden Banks National Marine Sanctuary on Horizon International's Magic Porthole Coral Reef Web page under Contests: www.magicporthole.org. Horizon International's oceans and coral reefs program website, Magic Porthole, at www.magicporthole.org, provides a window into coral reef life, presenting wonders of coral reefs and oceans, games, news, contests, exhibits and special features on dolphins, sharks, whales, sea otters and much more with contributions from aquariums, NOAA, and others.